Like many of Ohio's major cities of today, Akron owes its early growth to its geographic location and the Ohio and Erie Canal. Akron was originally laid out in 1825. The name came from a Greek word meaning "an elevation" or "point." 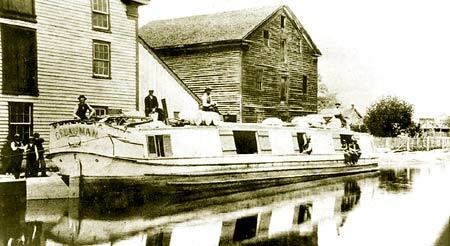 Many of the town's earliest residents were Irish migrants employed to build the nearby Ohio and Erie Canal. After 1827, when the canal was completed between Akron and Cleveland, the community's business interests began to prosper. Its location along the canal meant farmers brought their crops to Akron to be milled and then transported to other markets, and manufacturing interests such as mills, furnaces, and textiles also emerged. Although the importance of the Ohio and Erie Canal only lasted several decades, these were important decades when America was quickly emerging as a leader in the Industrial Revolution. Akron took advantage of this rapid growth. Just after the Erie Canal system was completed, railroads had started to be developed. Because important commerce centers had already been established by the canal system, the railroads took advantage of these centers. Because of Akron's geographic location, it made it a prime industrial location. Reliable and affordable transportation, clean water, cheap fuel from Ohio's coal fields just south of the city and plenty of factory labor provided the right mix for success. Akron was an industrial town and it's success or failure depended entirely on the nation's economy. When times were good, Akron thrived, but when times were bad, industries across the country had to make cuts, and for Akron, their prime business was supplying parts and materials for these businesses. This created tremendous problems for Akron that it had to overcome. It was a series of events that led Doctor Benjamin Franklin Goodrich to open a rubber plant in Akron in 1870. Rubber companies were plentiful in the mid 19th Century. Most were located in New York state. Even though B. F. Goodrich was a doctor, he wasn't very good at running a business and being a doctor at the same time. After several failed attempts at operating a doctor's practice, he got involved with a friend in real estate. Through this partnership, he acquired a failing rubber manufacturing plant. Try as he might, the business failed, primarily because of too much competition on the east coast. Goodrich decided to move the operation where competition wasn't so stiff. The exact reason why he came to choose Akron as the location for his rubber plant is a bit cloudy. Legend suggests that Goodrich was traveling by train to Cleveland when he entered into a conversation with an Akron business man who so impressed him, that Goodrich went to Akron to see for himself. Another version notes that while still in New York, Goodrich saw a handbill created by the Akron's Board of Trade that was widely distributed on the east coast in the 1870s. This flyer praised the town as possessing all of the pre-requisites of a manufacturing center. In any event, Goodrich did go to Akron and was introduced to industry leaders. That meeting went well for Goodrich and he secured the necessary financial backing from Akron's business leaders to make the move and setup his factory. So successful was Goodrich and his rubber company, that it attracted other rubber companies to the area. After all, if Goodrich could make successfully make rubber in Akron, so could they. In 1898 the Goodyear Rubber Company was formed and in 1900 Henry Firestone started his Akron rubber company in Akron. For 80 years, Goodyear blimps have adorned the skies as visible corporate symbols of the tire and rubber company that began operations in 1898. Today, these graceful giants travel more than 100,000 miles across the United States per year as Goodyear's "Aerial Ambassadors." The blimp tradition began in 1925 when Goodyear built its first helium-filled public relations airship, the Pilgrim. The tire company painted its name on the side and began barnstorming the United States. Humble beginnings to an illustrious history. 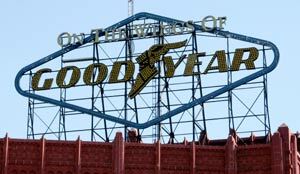 Over the years, Goodyear built more than 300 airships, more than any other company in the world. Akron, Ohio, the company's world headquarters, was the center of blimp manufacturing for several decades. Although the first Soap Box Derby was held in Dayton, the following year it was moved to Akron. The Soap Box Derby is a youth racing program which has run nationally since 1934. World Championship finals are held each August at Derby Downs in Akron. When the Ohio & Erie Canal was in operation, Akron was the highest elevation between Lake Erie and the Ohio River. It is here that the Locks changed numbers, meaning that the lock numbers got larger going either north or south from Akron. Lock 1 North is located just north of Cedar Street. There is also a Park at Lock 2 North that goes between Mill Street and Exchange Street in downtown Akron. Summit Lake is the practical dividing point, or the north-south continental divide for the canal system. Summit Lake is a natural lake which, prior to 1800, was surrounded by a a swamp. The lake had to be modified during the construction of the canal by lowering it by 9' so that it had the same elevation as the Tuscarawas River. Its size was also reduced in the process. A floating towpath along the swampy shore make it possible for the mule teams to get good footing as they passed through the area. Canton was founded in 1805 on the West and Middle Branches of the Nimishillen Creek, and became a manufacturing center owing to its location with numerous railroad lines. After the decline of heavy manufacturing, the city's industry has since diversified into service economy, including retailing, education, financial, and healthcare sectors. Canton goes back to 1769, when the site was bequeathed by a Delaware Indian to a white man and then sold to Bezaleel Wells, a surveyor from Steubenville. Bezaleel Wells, who laid out the first plot of land in the area, began selling lots in 1806. The name Canton was selected after Bezallel heard of the death of a man he admired. This trader, Captain John O'Donnell, who had been the first to import goods from Canton, China to Baltimore, had named his Baltimore property "The Canton Estate." Weeks before Wells recorded the plat of Canton, he heard news of Captain O'Donnell's death so he named the new village Canton. In 1811, the first schoolhouse was built. In 1815, Canton was incorporated as a village, 1834 as a town, and 1854 as a city. Today, Canton has both a keen sense of history and an optimism for the future. Home to the Professional Football Hall of Fame and the McKinley Museum and National Memorial, Canton also offers a vibrant arts community and plentiful shopping and restaurants. The Canton lifestyle combines the best of metropolitan and suburban living.